by Manie & MaRi Eagar. BC (and Canada) can draw on a wide range of strengths to sustain and grow its position as a leading hub for FinTech ventures. With a rich technology and innovation ecosystem driving the economy and job creation, opportunities abound to further support investment and nurture FinTech startups. BC should capitalize on its stable, deep and growing talent and skills pool, advanced education ecosystem, and existing international financial and business strengths to cement its position as a gateway to Asia and North America. A key milestone is Canada’s status as one of the early global RMB hubs, and the only one in North America. There is an opportunity to align FinTech support across government agencies and stakeholder initiatives. Additionally, there should be a focus on strategies that enhance funding and investments, infrastructure and skills development, job creation and business competitiveness, and BC’s FinTech events that build branding and creates marketing opportunities. Every effort should be made to keep BC tax and regulations friendly to draw FinTech opportunities, talent and businesses. Further research and education is needed involving all private and public stakeholders, and with an international outreach and best practice component. To realize the above opportunities and to sustain Vancouver’s status as a leading global FinTech hub, the community must support the development of academic courses in coding, RegTech, FinTech and the Blockchain. Government, industry and community stakeholders should jointly host a roundtable and play a leadership role in showcasing startup success stories at regular events and trade missions. By aligning FinTech with BC’s innovation and international marketing strategy, and harvesting funding opportunities with special attention to the new BC Tech Fund $100m VC fund, BC can build connections and knowledge exchanges to explore partnerships with leading global FinTech centres and trading partners. There is merit in investigating and investing in FinTech and related distributed ledger (Blockchain) technologies as a provincial strategy, following initiatives at leading financial centres such as London, UK. Consideration should be given to funding and/or support for a government proof-of-concept or use case study to highlight BC’s commitment and leadership in FinTech, particularly distributed ledger technologies. 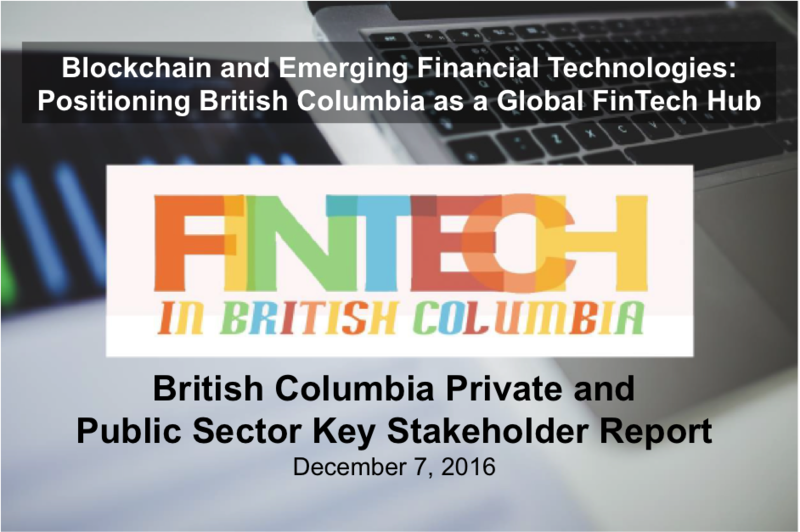 British Columbia is now ranked as one of the leading FinTech hubs in North America and internationally. This study indicates there is still much room for growth and a concerted effort by government, and closer collaboration with stakeholders and startups, will build on the current ecosystem to expand BC’s FinTech sector as a global hub of excellence, employing thousands of British Columbians.